This famous fairytale is German in origin and was published by the Brothers Grimm. 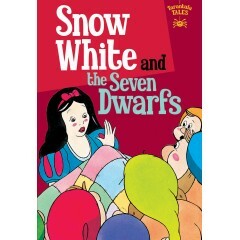 The story was made famous by the first animated film from Walt Disney in December 1937 who named the dwarfs. An earlier version by Grimm told it as the kings wife, Snow Whites mother who was jealous of Snow White, but the story was changed to make it a stepmother, to tone it down for children. There are similar older fairytales in history in Russia, Albania and Armenia.